We have many years experience of hospitality and welcoming visitors to our village and have aimed to use this experience to make your stay with us welcoming and pleasant. We have many visitors who frequently return to stay with us and hope this reflects that we are meeting the demands of tourists and workers who travel to Ullapool. To start your day well, a full traditional Highland Breakfast is offered with many choices including vegetarian, fully cooked breakfast with the famous Isle of Lewis Black Pudding, real porridge, a selection of cereals, fresh fruit and yoghurts and as much toast as you can eat. 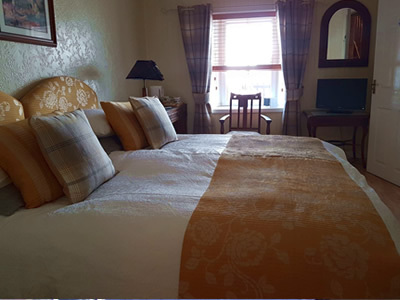 We have renovated Creagan in a style that retains the original 19th Century features but is tasteful, warm and comfortable. We try to ensure that guests are at home with us and will do our best to ensure a good stay be it for one night or a week. Pets permitted by request only, please contact us. Please note: in line with Scottish legislation, Creagan is a non-smoking home.